Millennium was stolen from his home at the Alley Pond Environmental Center. 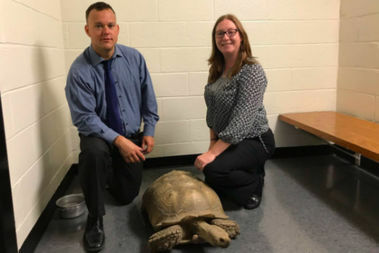 DOUGLASTON — Police have arrested a man accused of stealing a 100-pound tortoise from an environmental center last month, selling him for $300 to a buyer he met up with at a Connecticut train station, officials said. Shawn Waters, 36, of East Elmhurst, was arrested Tuesday in Queens and charged with grand larceny and criminal possession of stolen property, according to the NYPD. He swiped Millennium, a rare African spurred tortoise, from his sanctuary home at the Alley Pond Environmental Center on Northern Boulevard on either July 16 or July 17, according to officials. He cut a hole in the fence carried the hefty shelled animal out of his home, officials said. Waters then answered a Craigslist post from a man in Connecticut who was selling a musk turtle, offering to trade Millennium for it and $300, according to the criminal complaint. The two met up at a Metro North station in Fairfield, Connecticut, to make the swap, officials said. But the buyer later saw media reports about missing Millennium and contacted the 111th Precinct. Millennium returned home on July 25, where he enjoyed fresh vegetables with his pals. Waters, who has nearly 30 other arrests, was arrested a week later and arraigned Wednesday in Queens Criminal Court. “In the eyes of Millennium the tortoise, the wheels of justice must appear to be turning exceedingly swift," District Attorney Richard Brown said in a statement.